← Cow in the News! Cow (and Mike and David) have had a very successful month of May, mooing from the top to bottom of Minnesota. 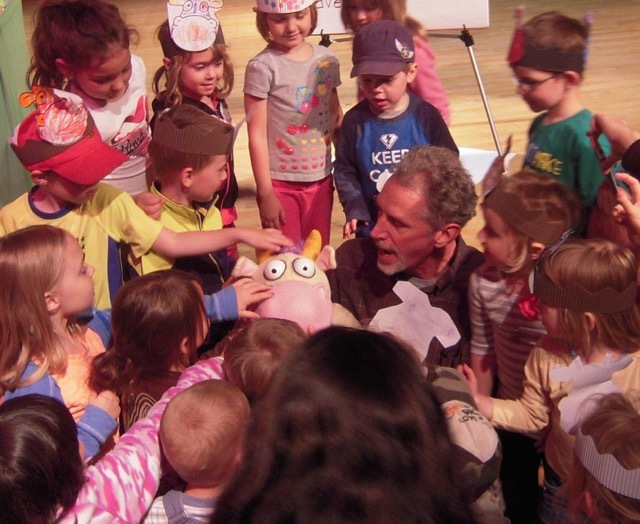 On May 8 Cow traveled far north, to visit 140 K, 1st, and 2nd graders at the Warren elementary school in the morning, and then performed for 70 folks at the Thief River Falls Public Library in the afternoon. A few days later she made a southern tour of the state, visiting over 200 kids at the Owatonna Public Library in the morning of May 11, and over 200 kids at the stunning Buckham Memorial Library in Faribault in the afternoon. The next day she was eager to visit with 120 day care kids at the Plainview Public Library and then had one of her largest crowds to date, over 250 kindergarteners at the Red Wing Public Library in the afternoon. Her final show of the month was on “da range,” visiting 170 attendees in Mountain Iron. Once again librarians were incredible, providing lots of activities and handouts for kids to enjoy, and making our job very easy. All this traveling can be exhausting, even for a seasoned veteran like Cow. She’s now on hiatus for over a month, at a location she’d rather not disclosed for fear of being mobbed by her adoring fans, but she’ll be ready to resume her road tour at the end of June (which she is quick to point out is National Dairy Month). 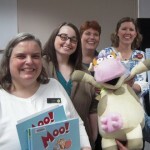 Darla, Reagen, Jennifer and Amy with Cow – Moo! 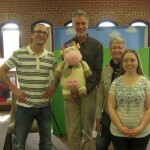 David, Mike, Kristi, Emily and Cow – Moo! too!